Messy Play Saves the Day! A couple of weeks ago I wrote about the importance of messy play – why kids need it and how to incorporate it into your play repertoire using simple kitchen tools and ingredients. I also shared a few tricks to help minimize the mess. 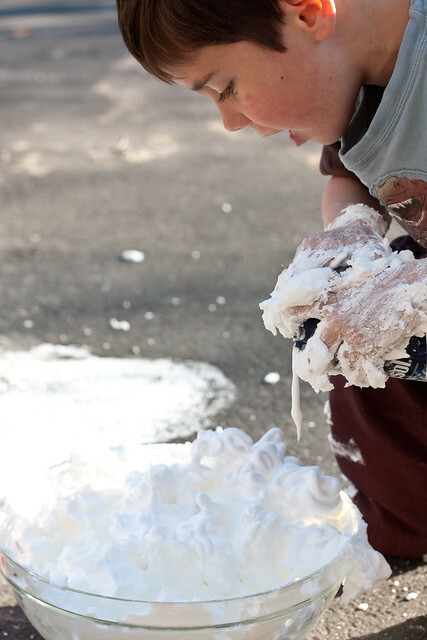 After all, there’s a fine line between messy play and creating a disaster to clean up. 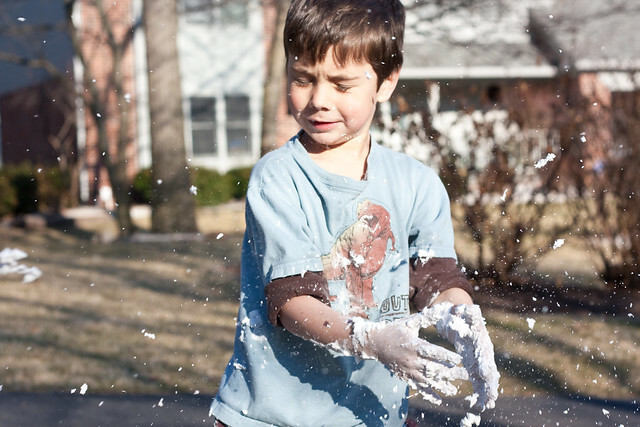 One of the many benefits of warmer days is the opportunity to take messy play outdoors. It’s the best of all possible situations – the kids get time outdoors doing what they love best (making messes), and you don’t find yourself mopping up after they’re done concocting and playing mad scientist. Another benefit of messy play is its ability to improve any mood. I discovered this the other day with Eli. It was a pretty day with just a slight chill in the air. After a day at school, Eli wanted nothing but the iPad. I took it away after his allotted after-school time and was instantly faced with the deadly combination of the boredom and grumpiness. There was no one else available to play and naturally it was the witching hour. You’re familiar, right? It’s that hour before dinner when the kids demand the most attention while you’re simultaneously trying to get dinner on the table and recuperate from the day. I often find that it’s in these situations when I’m most likely to cave and give in to more screen time. Luckily I remembered that we had the ingredients on hand to make foam dough. I set Eli up outside with a big bowl, a full can of shaving cream, and a box of corn starch. Does this look like a bored, grumpy boy? When it was time to clean up, we simply hosed off the driveway and put the boy in the tub. Store it all in a large plastic tote that can double as a giant mixing container. Adding a few things to your shopping list and keeping them together in one handy spot takes some time, but you’ll be rewarded many times over when boredom or grumpiness strikes. 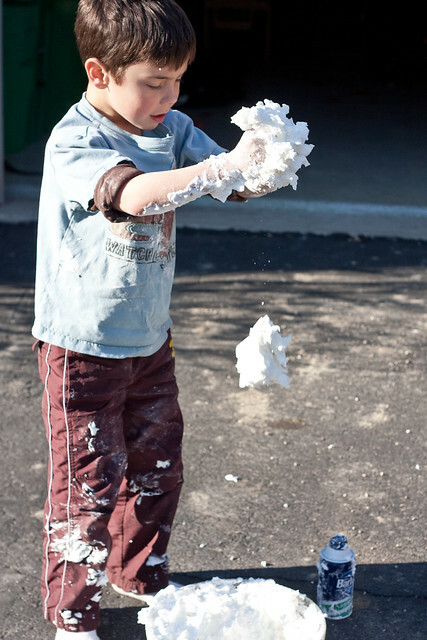 Do you have any other ideas for fun, messy play (indoors or out)? Share them with us!